It’s a favourite tactic of hate mongers and rabble rousers everywhere: quote something from the group you are trying to rouse against to show how they terrible they are, or, in the case of the “messianic jews” the additional aim, to show how the Jews agree with what they say. It’s not a new tactic, its been used down the ages and Jews have frequently been the target of such tactics. Probably one of the most known examples of this tactic is the book “The Talmud Unmasked” by the Reverend Parnosis in the 19th century. Much of that, plus some embellishments were utilised by Hoffman in the 1930’s to create hatred of the Jews in the official Nazi party magazine “De Sturmer”. More recently, in the 1980’s and 1990’s, there were the writings of Israel Shahak- a convert to Christianity who published many anti-Semitic books as well as originating a hoax when he claimed that he observed Orthodox Jews refusing to help a Christian on Shabbat and was told by a Rabbi their action was correct. Later he was unable to recall where the incident happened, who the Rabbi was, who the people involved were in fact, when challenged on the story his memory deserted him completely the Israeli Rabbinate produced Rabbinical responsa from the modern era and others dating back to the times of the Talmud to show his lies- yet for some reason anti-Semites still seem to take him at his word. So into this illustrious company the “messianic jews” of Yahoo! Answers have been joined. 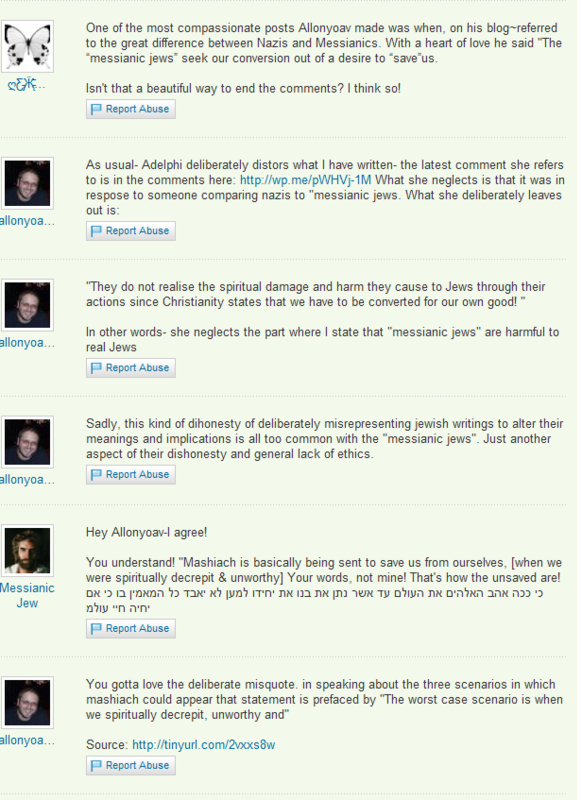 The fact that Adelphi under her Shay ID has posted quotes from Reverend Parnosis and from the hate site of “Brother” Knapper has been shown previously so to that we now show how Adelphi (under her new ID butterfly) and “Messianic Jew”- deliberately misquote and lie about the contents of this blog. 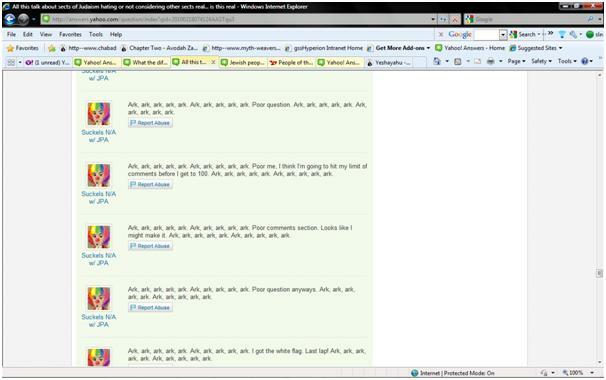 Yes ladies, gentleman and “messianic jews”- in comments on Yahoo! Answers, the “messianic jews” actually lie about this blog as if I wouldn’t be there to counter their lies! Messianic Jew the meizid brought to the place where they can see him and he cannot see them in order that he repeat his enticement to the person, and thus incriminate himself! THE DEATH PENALTY FOR MESSIANICS IS IMPLIED. BE CAREFUL. What he is supposedly quoting is from this post- and he deliberately leaves out the fact that the post clearly states this is not applicable in the modern era! Why he does leave it out? because in his hate mongering he is trying to create the impression that this is a hate site and calling for the death of the “messianic jews” (an accusation they have tried to use before to no effect). One of the most compassionate posts you made was , on your blog, you referred to a difference between Nazis and Messianics. With a heart of love you say “The messianic jews seek our conversion out of a desire to save”us.” How human you sound. Personally, I don’t equate the “messianic jewish” desire to convert Jews to the Nazi desire to destroy Jews. Yes, from the standpoint of Judaism their wanting to convert us is worse than the Nazis physical destruction as it results in punishment in this world, and kares in the world to come- however, the motivation is completely different. the Nazi’s sought our destruction and eradication. The “messianic jews” seek our conversion out of a desire to “save” us. They do not realise the spiritual damage and harm they cause to Jews through their actions since Christianity states that we have to be converted for our own good! One cannot equate a desire to destroy something to a desire to save something! What you need to understand is that Judaism does not say there HAS to be the war between Gog ad Magog (what you refer to as Armageddon except in the Jewish version there is no Satan, anti-Christ, horseman or in fact most of what is said in the New Testament in revelations…). The coming of Mashiach can be a number of ways depending on the condition of the world at the time and the spiritual state of the Jews at the time. It is stated that if all Jews were to observe two consecutive Shabbos’ the Mashiach would be instantly revealed and the messianic age started immediately. In that scenario the mashiach ben Yosef would NOT appear at all. Another intermediate scenario is if we are bein yonim (at an intermediate spiritual level- the exact definition of this is actually debated so I’m not going to elaborate on it)- in that scenario the appearance of Mashiach is more gradual and i mashiach ben Yosef may make an appearance as a politician or other similar figure- essentially a pre-cursor that elevates the world so we are heavier on the “good” side. The worst case scenario is when we spiritually decrepit, unworthy and Mashiach is basically being sent to save us from ourselves (kinda along the lines of why God used the years of suffering of Avraham and Sarah (they are considered to have suffered 190 years waiting for the birth of Isaac- thus the 100 years of Age of Avraham at the time plus the Sarah’s 90 years) to count against the years spent in Egypt so he could redeem the Jews earlier). IN that scenario you have the war of Gog and Magog and mashiach ben Yosef is a general/war chief whatever and is most likely the first person to be resurrected when all the dead are brought back to life. However, just to emphasise the point- the two are very close together in time if not continguous and overlapping and Mashiach ben Yosef does not do any of the tasks set aside for Mashiach ben David. Youre chasing butterflies. How old are you? You are making a clown out of yourself. No. I am NOT messianic. כל הכבוד May you continue to have much succes in showing everyone the methods of these chamorim! May all the reshai’im fall into the habit of betraying themselves by their words so that others can learn to avoid them and treat them with the contempt they deserve! How did you get this way? Was it your parents, perhaps a nanny, uncle Ernie, a bad Rabbi? Who did it? Who filled you with so much hate for people? I feel bad for you. I honestly do. one day I hope you learn to not other people’s spiritual walk. People are free to chose what and how they worship like you have that right. I blame your Community and your parents. I’m sorry but they both FAILED YOU. Take a deeper look and judge people on the content of their character, not by what their religious affiliation is. I ask you form the bottom of my heart please reconsider your path in life. At the present nobody having a site like yours could be a good rabbi. Imagine if you focused all your energy towards good. You could go down in history as a humanitarian. Note how the only way “messianic jews” know how to communicate is via insults? They seem proud of the bad behaviour of their co-religionists! The love of deceit and misrepresentation that characterises their interaction with the Jewish community is epitomised in these comments- a refusal to condemn dishonesty and hate mongering- while insulting the person who points it out!